160 HP Divider gearbox and 100 HP wing gearboxes: A rugged heavy built gearboxes capable of handling heavy cutting applications. Input driveline: Cat. 4 CV: Driveline is matched just right for capacity of tractor. Constant velocity (CV) U-joint allows for 80 degree turns without doing damage to the driveline. Easy greasable drivelines: Drivelines have access holes for greasing the U-joints and to grease the inner profiles. 2 Plate slip-clutch: Protects drivelines and gearboxes by slipping clutches rather than twisting the driveline when impacts are encountered. 16,500 FPM High blade tip speed: Allows clean cutting of material and even distribution. Left wing rotates counterclockwise: Better discharge of material. Picks up tractor tracks. 11" Deck height: Handles heavy cutting, which reduces balling-up of cut material under the deck. 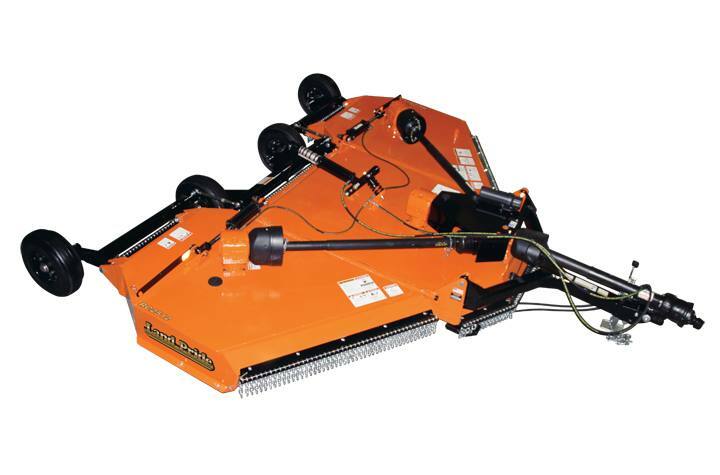 10 Gauge Stump jumper backed with a 1" thick mounting bar: Allows cutter to slide over obstructions protecting gearbox output shaft & bottom seal. 3/16" Plate side skirt: Reduces debris piercing possibilities. Low hitch weight: Less drawbar wear. Less ballast required. Works well with lighter tractors. Single remote hydraulics: Easy to operate. Fits most tractors, only one duplex outlet required. Hinged wing sections: Allows cutter to follow terrain. 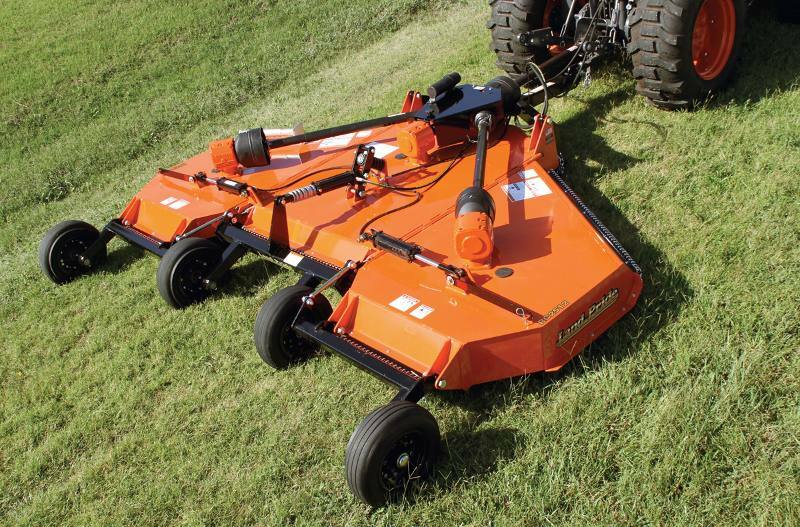 Ideal for rough ground where hillsides, ditches and hollows can cause uneven cutting. 7/8" Solid hinge rods: Gives great strength to the cutter from front to rear, and in the hinge area itself. Spring-cushioned lift cylinder: Cushions loads on drawbar. 7/8" Leveling rods: Large diameter leveling rods provide superior supporting strength over rough terrain. Airplane tires with flotation lip: Gives better cushion while transporting and provides flotation in soft ground. Gearbox Shafts - Output Shaft: 1 1/2 in. Cutting Width: 12 ft. -0 in. Overall Cutting Width: 12 ft. -7 in. Minimum Transport Width: 7 ft. - 11 in. With front cutting blade 1 1/2 in. off the ground. Overall Length: 13 ft. -3 in. Cutting Height: 1 1/2 in. to 12 in. Wing Flex: 22 deg. Down and 45 deg. up while cutting.